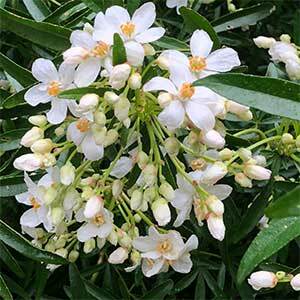 A free flowering variety with fine foliage Choisya ‘Aztec Pearl’ is evergreen and in spring is covered with masses of flowers. 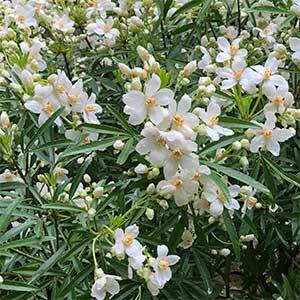 This is a hybrid and the botanical name is Choisya x dewitteana ‘Aztec Pearl’. The new buds appear pink in early spring to summer, the flowers open to a pure white and are slightly fragrant. With its dense foliage, this variety makes good hedging plant or medium sized screening plant. The fine foliage can make a good contrast against a background of broader leafed shrubs. This is a very versatile variety, it has a natural dense growth habit and once established is remarkably hardy. Soil moisture is required for good growth, so we suggest that you mulch around the plant to help maintain a cool moist root run. Tip pruning each year will keep them in good shape with a nice bushy habit. The plant can be pruned back hard in early spring if regeneration is required. Although this a reasonably drought tolerant plant once established it will perform better if you keep some moisture through summer. Frost tolerant – Yes, medium frosts are OK.
Choisya ‘Aztec Pearl’ is available for sale from the following participating nurseries.